Is Standing Rock the line in the sand where Americans demand a do-over? Does the heroic action of Natives suddenly provoke the nation to a change of heart? American Progress, an 1872 painting by John Gast, is an allegorical representation of the modernization of the new west. Here Columbia, a personification of the United States, leads civilization westward with American settlers. She then brings light from the East into the darkness of the West, stringing telegraph wire as she sweeps west; she holds a book that “represents learning and knowledge” as well. The different stages of economic activity of the pioneers are highlighted and, especially, the evolving forms of transportation. But that wasn’t the end of forced Sioux treaties. “The Treaty of Fort Laramie (also called the Sioux Treaty of 1868) was an agreement between the United States and the Oglala, Miniconjou, and Brulé bands of Lakota people, Yanktonai Dakota, and Arapaho Nation signed on April 29, 1868 at Fort Laramie in the Wyoming Territory, guaranteeing the Lakota ownership of the Black Hills, and further land and hunting rights in South Dakota, Wyoming, and Montana. The Powder River Country was to be henceforth closed to all whites. “Repeated violations of the otherwise exclusive rights to the land by gold prospectors led to the Black Hills War. Migrant workers seeking gold had crossed the reservation borders, in violation of the treaty. Indians had assaulted these gold prospectors, in violation of the treaty, and war ensued. The U.S. government seized the Black Hills land in 1877. 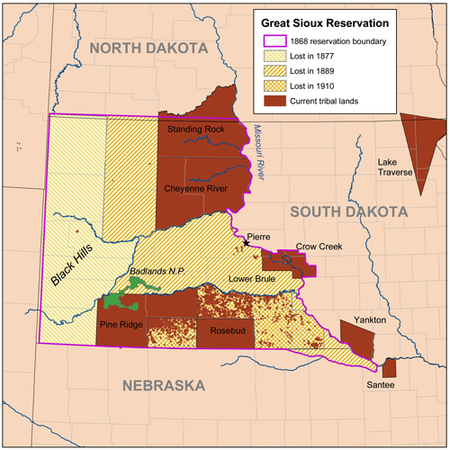 “More than a century later, the Sioux nation won a victory in court. 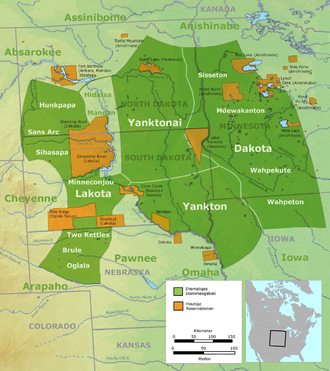 On June 30, 1980, in United States v. Sioux Nation of Indians, the United States Supreme Court upheld an award of $15.5 million for the market value of the land in 1877, along with 103 years’ worth of interest at 5 percent, for an additional $105 million. The Lakota Sioux, however, refused to accept payment and instead demanded the return of their territory from the United States. In the tradition of all ancient native people, the Standing Rock protesters’ view is broader and longer term than the typical white view. For ancient people, monetary gain has no standing compared to the value of drinkable water. Someday the pipeline will leak. Maybe not in our lifetime or even in our children’s lifetimes, but someday the pipeline will leak. What then? The oil won’t just wash away in the next rain. It penetrates the soil where it continues to pollute for decades. Or longer. There is no argument against this. The Sioux protest at Standing Rock is legitimate in its concern over the long term future of the water. And what the hell difference does that make? When have the white invaders of North America (and South America, Central America, the Pacific Islands, etc.) ever considered the long term impact of their actions? Our ‘manifest destiny’ was to expand across the continent to ‘redeem’ and remake the land in the white vision of farms and villages. While not embraced by all political leaders of the 19th century, the concept of manifest destiny was widely held by whites and fit hand in glove with the view that we alone held special God-given virtues that granted us exclusive right to fulfill this destiny. It was our duty as whites to cleanse the lands of heathen beliefs and believers. It was our duty as whites to pursue progress even if it meant using slaves to do so. And so forth. The reward for such noble efforts was to reap the bounty these lands had to offer. Gold and silver. Virgin timber. Animal skins and meat. Oil. The DAPL pipeline is more of the same. We found this oil and we need it. A bigger issue looms behind this protest. If by some quirk the Sioux are the ultimate winners of this contest, think of what might happen next. If their treaties are to be honored, if their ancestral lands and holy places and burial grounds and natural resources are found to be theirs, what happens to all the white people who have bought those lands, built their houses, barns and fences, sent down roots for over four generations? What happens with all the other Native tribes’ treaties that have similarly been ignored? Are we ready to give up the majority of our homes, schools, cities, and workplaces in order to honor our treaties? Once we acknowledge the rights of the Sioux to determine the fate of the DAPL, we’re on a slippery slope toward that end. This is why you won’t see elected officials rushing to the side of the Standing Rock protesters. They’re sworn to uphold our laws. Our laws, not the long held beliefs of Natives. We enforce our laws now just as always—by force. Our laws are part and parcel of manifest destiny. We made them to suit us, not the Natives. If we pick at one thread in our long history of occupation and oppression, the entire fabric of our way of life starts to unravel. The law says protesters are occupying private land. The law says that Energy Transfer Partners, the Army Corps of Engineers, and others have met the legal (our law) requirements for building the pipeline. The law says that trespassers and obstructionists are subject to arrest for violating the law. We want what we want. We want to drive our cars to the theater and grocery store. We want the internet, running water, and convenient heating and cooling. We’ve invented these things to further advance our well-being. To justify all that has come before including slavery and genocide, we can point to landing a man on the moon, modern medicine, and the microchip as a few examples of our superiority. Even a win for the Standing Rock protest would not solve the bigger issue. Even if by some fiat the pipeline route is changed, or the oil piling up at the fracking sites is ultimately moved by truck or railcars, the bigger issue remains. We live on Native lands and harvest Native resources. When the gold, silver, copper, rare earth, and every other microcosm of value have been mined, cut, harvested, and fished, then what? When the waters become too polluted to drink or feed our crops, then what? When the soil becomes too depleted and contaminated to grow our food, then what? Deforestation is one of the main causes of climate change. It is the second largest anthropogenic source of carbon dioxide to the atmosphere, after fossil fuel combustion. We’ve pretty much run out of new continents to exploit. We already see the horizon. It is there in the wasteland of our industrial cities. It is there in the overflowing containment ponds leaking hazardous mining waste. It is there in the lost futures of whites who believed in their manifest destiny and now find themselves discarded as Destiny chooses robots instead of men to build cars. Manifest destiny gave us this land. It gave us right to work laws that gutted the power of organized labor. It gave us multi-national corporations who have no allegiance except to money. Manifest destiny still drives not only our national attitude about domestic affairs but our international policies as well. “The belief in an American mission to promote and defend democracy throughout the world, as expounded by Thomas Jefferson and his “Empire of Liberty” and Abraham Lincoln, was continued by Theodore Roosevelt and Woodrow Wilson. Under Harry Truman (and Douglas MacArthur) it was implemented in practice in the American rebuilding of Japan and Germany after World War II. PreviousLaughter in the halls come walk with me in the sunshine darling.